A world-class casino deserves nothing less than a world-class sign-up bonus. 100% on your first deposit up to $555 in extra cash! Take that $555 and get ready for the ultimate player-friendly internet casino, with an enormous selection of classic and modern-style casino games. All the games you've known and loved for years are available including Blackjack, roulette, Slots, Video Poker, Craps, and Baccarat! The Reel Deal, What's Your Sign? Qweas is providing links to GoldenCasino 2011 as a courtesy, and makes no representations regarding GoldenCasino or any other applications or any information related thereto. Any questions, complaints or claims regarding this application GoldenCasino 2011 must be directed to the appropriate software vendor. 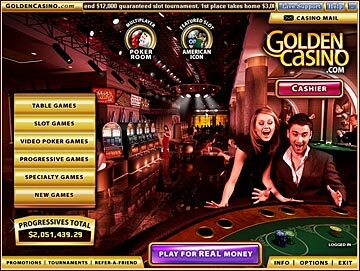 You may click the publisher link of GoldenCasino on the top of this page to get more details about the vendor.